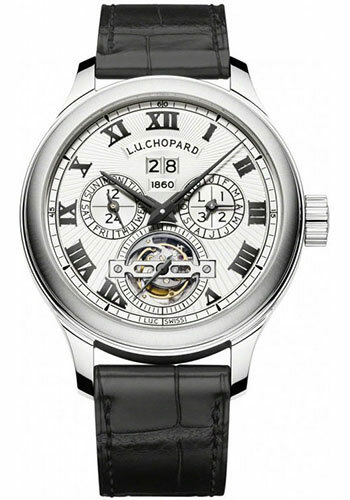 46mm 18K white gold case, 18.50mm thick, with see-through sapphire crystal back, 18K white gold crown, sapphire crystal, gold dial, L.U.C 05.01-L manual movement with tourbillon, perpetual calendar, 24 hour scale, hours and minutes, small seconds, power reserve indicator, date, days, months, four year leap year cycle, orbital moon phase display, day and night display, equation of time, sunrise time and sunset time, approximately 170 hours of power reserve, black alligator strap with hand sewn matching tones, 18K white gold pin buckle. Water resistant to 30 meters. 46mm 18K rose gold case, 18.50mm thick, with see-through sapphire crystal back, 18K rose gold crown, sapphire crystal, gold dial, L.U.C 05.01-L manual movement with tourbillon, perpetual calendar, 24 hour scale, hours and minutes, small seconds, power reserve indicator, date, days, months, four year leap year cycle, orbital moon phase display, day and night display, equation of time, sunrise time and sunset time, approximately 170 hours of power reserve, black alligator strap with hand sewn matching tones, 18K rose gold pin buckle. Water resistant to 30 meters.